The Open Country Gardenmaster Dehydrator, Model FD-1010SK, provides you with a fast and powerful way to dehydrate food for camping, hiking or food storage. It features 1000-watts of drying power, a quiet 2,400 RPM motor that circulates air up the exterior pressurized chamber, then horizontally across each individual tray, converging in the center of the dehydrator so each tray receives its own supply of fresh, dry air. 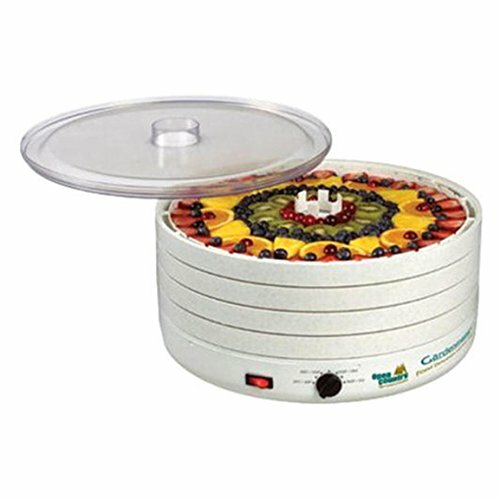 This exclusive Open Country dehydrator design prevents flavor-sharing and produces even drying without tray rotation. The thermostat is adjustable from 95° to 155°F. Triple-wall insulated trays minimize energy loss and maximize efficiency. As needs grow, this four-tray unit can be expanded up to 30 trays. Comes with 4 extra-large drying trays, 1 Fruit Roll Sheet, and 1 Clean A Screen, 1 Packet of Jerky Spice and Cure, and a 52-page Recipe and Instruction book. If you have any questions about this product by Open Country, contact us by completing and submitting the form below. If you are looking for a specif part number, please include it with your message.